Twenty years ago, the Wheaton Alumni magazine began a series of articles, titled “On My Mind”, in which Wheaton faculty told about their thinking, their research, or their favorite books and people. 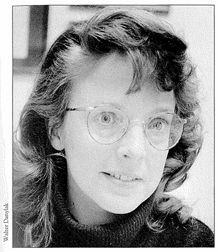 Former Assistant Professor of New Testament Studies Nancy L. Calvert (who taught at Wheaton from 1990-1997) was featured in the Spring 1996 issue. Come late June, I’ll be getting married. It’s a big step, and I’m taking it later in life than most. David, my fiance, and I are glad to have found each other. We sense God’s timing in bringing us together in the midst of our busy lives and careers. Yet each of us finds that we harbor some fearfulness about joining our lives. We have each established personal and professional identities. Getting married will involve sacrifice–but how much of our respective identities are at stake? My approaching marriage has prompted me to examine the source of my identity more closely. I imagine that I am not alone when I admit that the person I have become is partially a result of my seeking the approval of others. By taking on characteristics, however, that are deemed important by another person, or by performing according to someone else’s perceived standard, it is as if you and I believe that we are valued only if we can somehow earn another’s respect and love. If this approval-based mindset is central to our identity, it can render us oblivious to the wonder of how God created us and to his purpose for our lives. It allows others to gain control of our lives–a control that ultimately belongs to God. In his book, A Pretty Good Person, Lewis Smedes wisely states, “One way to get in control of one’s life is surrender to unconditional love…I have to get back to that surrender now and then or I lose control again to the demon of other people’s approval” (p. 110). If our identity depends on others’ approval and not on God’s unconditional love, chances are that we will never fully discover what makes us able to serve God in our unique way. Another source of self-identity is our life experiences. Yet at times, our experiences can become like prisons. It may be too threatening to actually discern what in our past shackled us to a certain perception of our world, ourselves, or God. But unless we are willing to name, evaluate, and revise the ways we perceive the world, we cannot freely embrace the life God has so graciously granted us. In recent years, many scholars have examined the apostle Paul’s call to preach to Gentiles (one example is Krister Stendahl’s Paul Among Jews and Gentiles). In his providence, God gave Paul the background to succeed in his ministry to Gentiles. Paul was familiar with Hellenistic ways and philosophies, and Jewish culture and theology. He was also fortunate enough to be a Roman citizen, But in that dramatic encounter with the living Christ on the road to Damascus, Paul was blinded and his whole world turned upside down. He discovered that the very man whose followers he had been persecuting was actually the Messiah. Once the Lord broke through his prison of misconceptions, Paul found his identity in Christ and his life’s focus in fulfilling God’s new purposes for him. He neither sought to gain the approval of devout Jews who knew him in the years before his calling, nor of those who believed that Gentile believers must take on the Mosaic law. God may not use visions and blindness to bring us to a better understanding of his purpose for our lives. But he often uses events or people to get our attention, to help us better understand who we are and how we can serve God in our own unique way. As David and I enter marriage, we must remember that our identities are ultimately rooted in Christ–though the counsel of others may be important. Together we must work in such a way that God can best fulfill his own unique purposes for us in the arenas of our professional and married lives. Doing so won’t be easy; we may have to expose one another’s shackling misperceptions from time to tune. Our identities will probably be remolded to some degree. But it would seem that only in this way can we even begin to find the joy of living together according to God’s loving guidance. Dr. Calvert is assistant professor of New Testament studies. She received her Ph.D. from the University of Sheffield, England, her M.Div. from Gordon-Conwell Theological Seminary, and her B.A. from Wheaton. She is an ordained Presbyterian minister (PCUSA) and serves as parish associate at the First Presbyterian Church of Glen Ellyn. In her spare time she likes to listen to classical music, read, watch “Frasier” and films remakes of Jane Austen novels. But mostly she corresponds with her fiance via e-mail.